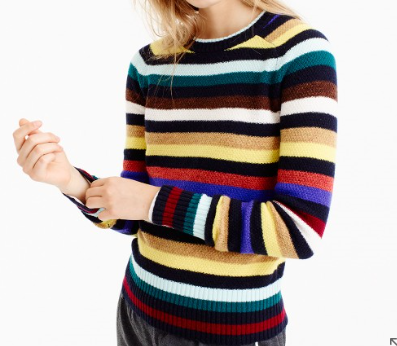 From the moment I saw this sweater on J.Crew's website I started stalked it. There is something about the mix of bright colors that feels very 70's and I knew I had to pair it with flare jeans to take it to the next level. I envisioned throwing up a piece sign and wearing round sunnies but it was confirmed that THAT was taking it too far! Anyway, this sweater was really popular and by the time it went on sale it was in and out of stock. The retail gods aligned and I was able to snag my size at 40% off! The sweater has since sold out completely but I linked some very similar versions below. The first sweater is from J.Crew Factory but for some reason when I try to link it, I'm getting an error. It's listed under the "Clearance" tab then categorize by "sweaters."